The Sky is Falling! And the Seas! And the Mountains! And theaaah! Back in the 1970s, when Irwin Allen was the master of disaster, filmmakers regularly trotted out the same old creaky tropes by grouping together a hodgepodge of celebrities, of varying renown and talent, and then throwing them in harm’s way. The formula didn’t always work, but it did work often enough for moviemakers to keep trying. Allen produced two of the best examples of the disaster film with these tropes: the capsized-ship story The Poseidon Adventure, and, my favorite, the burning skyscraper story The Towering Inferno. Those two films are prime examples of expertly crafted cheese and the reasons that I have such a goofy affection for the entire disaster movie genre. I love the way the varied cast members interact amidst the effects, especially Inferno’s parallel plotlines starring Paul Newman and Steve McQueen that build to the inevitable meeting of these two very cool men. To this day, I get excited when I see one of those posters with the line of little portraits revealing the cast in peril. Since the mid-1990s Roland Emmerich has been making big-budget explosion films that are mostly of the disaster persuasion, staking out a corner of contemporary cinema that looks an awful lot like Allen’s 70s pad. But Emmerich has been wildly inconsistent. There’s the passable Independence Day (1996), which, despite its exploding landmarks, is actually more of an alien-invasion movie. He followed that with Godzilla (1998), a horrible half-hearted movie. 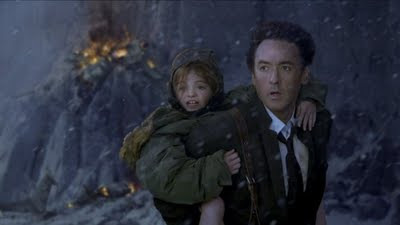 But somewhere around the middle of this decade, Emmerich went full-disaster with The Day After Tomorrow (2004), a flawed but enjoyable popcorn flick that found weather raining down destruction on New England (elsewhere too, but our ensemble is exclusively East Coast). 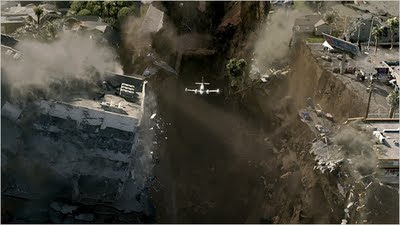 Now, with 2012, Emmerich has used a misreading of the Mayan calendar as the jumping point to top all of his movies, and all disaster movies, in premise, not always in quality. He exploits the same kind of whiplash-inducing “thousands are dying, but save the dog!” mentality that has long served peddlers of schlock well, and here it is done very well. Forget escaping a boat. Forget putting out the fire. Forget staying warm. There’s nowhere to run when the whole world is coming to an end. (But don’t worry too much; some of the cast will still have a happy ending). 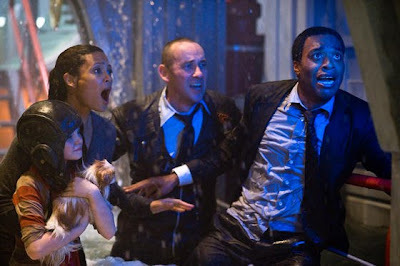 Speaking of the cast, it’s an odd mix that’s suitably eclectic, with two very likable actors, John Cusack and Chiwetel Ejiofor, as a sci-fi writer and a scientist, respectively, doing most of the earnest heavy-lifting. (It’s nice to think that someone, somewhere, might think Cusack and Ejiofor could be our Newman and McQueen). Ultimately we need to think that the problems of the small ensemble cast do amount to at least a hill of beans on this hemorrhaging planet and Emmerich was lucky enough to get an ensemble that would work hard to elevate the horrendous dialogue that he co-wrote with his composer, Harold Kloser. There’s Amanda Peet, as Cusack’s ex, and Tom McCarthy as her new man. There’s Danny Glover as the U.S. president and Thandie Newton as his daughter. There’s Woody Harrelson as a kooky conspiracy-nut and Oliver Platt as a slimy bureaucrat. There's also some cute child actors and a little dog. Even George Segal shows up in an extraneous subplot, but then again, anything that isn’t a crumbling landmark is sort of extraneous. Let’s get back to the disasters. Earthquakes! Volcanoes! Tidal waves! There’s nothing but destruction happening here and it’s played out with incredible special-effects that are sometimes scary, sometimes silly, but always enjoyable. Emmerich has perfected a kind of industrial-strength filmmaking here in an entertaining blend of silliness and suspense from the ominous title card to the perfect deep-fried cheese that is the end-credit-caterwauling of Adam Lambert. Other than a lame half-hearted nod towards a social conscience, the movie proceeds with a determined desire to let us marvel at the effects, to let us revel in his amiably dumb light-and-sound show. I was never bored, occasionally thrilled, and often amused. Emmerich finds a good spot between camp and cool and rides it for two-and-a-half hours. 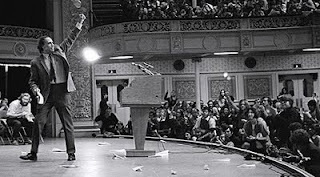 William Kunstler is a fascinating figure, a lawyer who was, by all accounts, normal, with a quiet suburban life, living the 1950s American Dream, until the Civil Rights Movement awakened something within him. He began to take on difficult or unpopular causes defending all manner of undesirable cases and calling himself a "radical lawyer." The story of the second half of his life plays like a checklist of important events. He defended the Chicago 7. He was a negotiator for Native Americans who took over Wounded Knee and for prisoners who took over Attica prison. He defended alleged murderers, rapists, and terrorists, sometimes convinced they were innocent (in fact, they occasionally were), other times convinced, simply and purely, that everyone had a right to be defended. For this he received jeers, even hatred, and indeed it's often hard to reconcile the need for justice and the need for revenge when confronted with some of his most difficult cases. It's amazing that he held so stubbornly to his ideals in the midst of so much conflict. He was a noble man who bravely did unpopular things so it’s most interesting to watch William Kunstler: Disturbing the Universe and hear his actions' ramifications on his family. 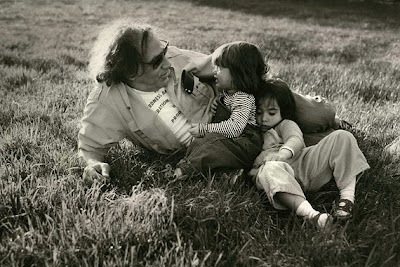 The documentary is directed by his daughters, Emily and Sarah Kunstler, and they do a fine job balancing the film between a recitation of the facts of his life and a portrait of their relationship with him. Luckily, they don’t dip into the well of sentiment to jolt their movie to life. They realize that their father had an incredible life and are smart enough to stay out of the way of facts, even if it means that the movie occasionally drifts too far into territory that could be covered by an episode of Biography. But the Kunstlers have an advantage over Biography in their personal connection with the subject and use it, not to filter the facts and create a gleaming hagiography, but to truly grapple with what it means for a person to be uncompromising in pursuit of justice and how that affects those that are closest to him. This not a perfect film but it’s a consistently compelling one. The footage is often absorbing; the Kunstlers have done a good job mixing home videos with newscasts. The film is remarkably balanced for such a personal story. I’d bet that no matter what your opinion is going in to the film, you’ll come out with plenty of evidence to reinforce it, but also, having been exposed to other points of view, in possession of a more well-considered opinion. Most importantly, this is a story that deserves to be told, and told well. Emily and Sarah Kunstler have done just that. By embracing their father’s flaws, they have created a film that emerges as a complicated and loving portrait of a fascinating man. Richard Kelly has been working on an odd little resume, but I like that about him. He made his directing debut with Donnie Darko, a deeply strange, but dreamily haunting little movie about a boy who hallucinates (or does he?) an evil giant rabbit. That film flopped, but developed quite a loyal following. 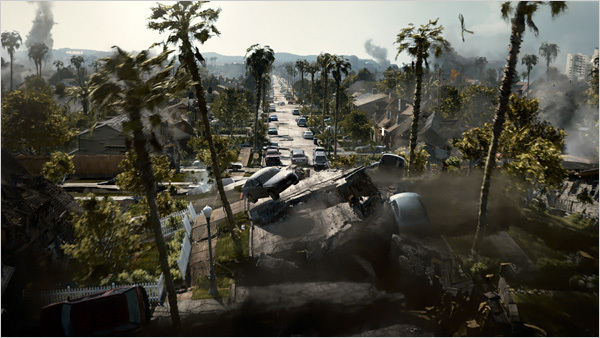 As a follow-up, Kelly made the even stranger, and totally insane, Southland Tales, a cluttered futuristic allegory so disjointed and chaotic it’s as if Kelly skipped the main plot and wrote his own fan-fiction for a world only he knows. Nonetheless, some thought it brilliant while the rest of us scratched our heads. Now we arrive at his third feature, an adaptation of a Richard Matheson short story and Twilight Zone episode, The Box and, while it doesn’t quite have the same emotional spark of demented creativity that can be found in Darko, it has its own haunted brilliance about it. Set in 1976, the movie opens with a suburban middle-class couple (Cameron Diaz and James Marsden) receiving a mysterious package, left on their doorstep under equally mysterious circumstances at dawn. Upon opening the package, they find a box and a note, informing them that a Mr. Steward will show up at 5pm to explain everything. Indeed he does. Steward (Frank Langella) tells them that if they push the button on the box within 24 hours, two things will happen: 1. they will receive $1 million in cash. 2. someone whom they don’t know will die. This sets up a moral dilemma that is debated (or dithered about, depending on your point of view) for the better part of the first act, following more or less the format of the original story. But Kelly is sowing the seeds for his expanded plot so that, when the decision is made, the movie makes a leap into stranger and stranger territory while still retaining a spooky sci-fi Twilight Zone sizzle. This is the kind of movie that pulls the rug out from under you and then keeps going, finding more and more rugs until you realize you had been standing on more rugs than you could have ever thought possible. Cue the theme music. The movie is not set in the 1970s just to take advantage of the garish wallpaper and tight bellbottoms, although those accoutrements are certainly present and accounted for. The movie embodies a low-tech terror in the way research must be done at a library, in the way characters can’t communicate quickly, and in the way that, when something really creepy starts going down, there’s not the calming promise of help a mere cell-phone call away. This is a period-piece freak-out that takes full advantage of its setting, but also its subconscious ties to the filmmaking of the time. Kelly shoots the movie with a soft image, lightly grainy with slightly smeared colors, giving the movie a dreamlike feel of stumbling late at night into a pretty good, half-forgotten and half-junky 70s suspense flick. It feels like it would make a great double-bill with something like The Fury. The performances are nearly perfect (besmirched only by Diaz’s odd accent) for their type, the kind of perfectly bland persons who find themselves more harried and mangy as the story unfurls. There are all sorts of wonderfully cast supporting roles filled by actors who had to have been picked based mostly on their ability to look conspiratorial. Langella projects an eerie calm in the center of the plot, doing things in specific and methodical ways but with his goals obscured to maintain utmost oddity and creepiness. It’s when we learn why he’s doing what he’s doing, through a long expository sequence, that the movie loses some of its effectiveness. Like Darko before it, The Box doesn’t quite add up its divergent strands of sci-fi subplots and even if they did it would probably be disappointing, but it cruises along with such admirable effectiveness and a shivery haunted quality that it doesn’t quite matter. The movie stirred up my fears, stimulated my heart rate, and jangled my nerves. Even though the movie lets the air out of its balloon a little too early, it still manages to finish strong by turning the finale into a nifty mirror of the first-act’s moral dilemma, crystallizing the central quandary and pushing aside the twisty, complicated plot to shoot straight to the gut. In the end, The Box is a movie of mood and suspense so admirably sustained that it left me smiling while shivering in my seat as the credits rolled. Note: The Box would make a great third-section to a triptych with The Happening and Knowing. The three recent films, modern B-movies really, have been on the receiving end of sneers and derision from some critics and audiences, but all three have wonderful Twilight-Zone-style hooks that are enjoyably, if a little inconsistently, executed. The Men Who Stare at Goats has a great title and, with George Clooney, Ewan McGregor, Jeff Bridges, and Kevin Spacey, a great cast. Unfortunately, it’s a comedy that’s stuck awkwardly between light and dark, soft and edgy. It spins its wheels tonally while also forgetting about narrative drive or thematic development. 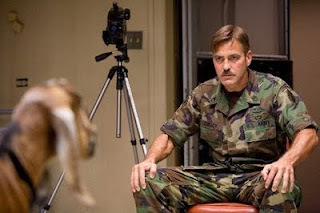 As a result, it’s merely 90-minutes of watching big stars goof around in a giant sandbox playing true characters, mostly (Clooney, Bridges and Spacey) psychic soldiers trained in a secret Armed Forces project known as New Earth Army. McGregor is just a tag-along journalist (inexplicably shifted from London to Ann Arbor in a pointless case of adjusting the truth) learning about the history of the group, who call themselves Jedi Warriors (cute, considering they’re talking to Obi-Wan Kenobi). The four men provide the film some modest pleasures. Clooney is good-natured and humorous, as he usually is, here deadpanning dubiously effective combat technique and flatly describing improbable abilities including a “death tap” that killed a man (Instantly? Nope. Eighteen years later. One never knows when the curse of the death tap will strike). Bridges is basically an enlisted Lebowski who indulges in New Age hippie-culture and invents the majority of techniques on display. Spacey has a great few scenes, rolling back his eyes and talking in a funny voice for one scene in which he tries to fake paranormal powers. In another scene he will calmly pass on good wishes to a newlywed couple with the funniest two lines in the movie (Spoiler: “Congratulations. Sorry it doesn’t work out”). Directed by first-timer, but longtime actor, producer, writer, and friend of Clooney, Grant Heslov, the movie ends up a wishy-washy mess, not as good as it should be, but not as bad as it could have been. The movie’s good-natured enough, but ultimately Heslov can’t muster up enough heft to really start the movie so that by the time it’s wrapping up I found myself thinking “is that all?” It’s a goofy, insubstantial little thing (save for a case of most unfortunate timing with a scene showing an acid-tripping soldier shooting up his base) that just never works. The last scene has McGregor’s reporter typing away, promising to tell the world what happened, then lamenting that his story received little coverage in the media. We’re supposed to sympathize with him, but I found myself agreeing with the media. This story’s a non-starter. 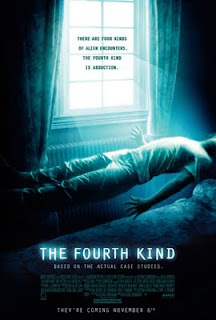 The Fourth Kind is two movies, a dumb low-budget horror and its even dumber big-budget remake, fighting with each other. Who wins? I couldn't say, but I do know that it certainly isn’t the audience. This is a howlingly bad horror movie with only two or three scares and those are of the cheap loud-noise variety. The hook is that this movie about alien abductions is peppered with “real” footage and interviews that literally push the glossy picture out of the frame with wobbly split-screens showing the stark contrast between the videotaped “reality” and Hollywood reenactments. Pardon my quotation marks; this is the kind of movie that wants so much to be taken seriously, to make us feel like it couldn’t all be false, that quotation marks are the only proper deflation. I’m fighting silly with sillier. Milla Jovovich is the lead in the reenactment, as Dr. Abigail Tyler, a psychologist in Nome, Alaska who’s just plain crazy over this whole alien thing. The woman who plays the “real” Dr. Tyler is listed in the credits only as Dr. Tyler which is a shame because she’s giving a better performance. The movie tries to force verisimilitude with little title cards that pop up with the first appearance of a character in the reenacted portions of the film. For example there’s “Elias Koteas, actor” playing a skeptical colleague of Dr. Tyler. A little later we meet “Will Patton, actor” playing Sheriff August, who flips out over the real-world tragedies occurring in his town, including the one nearly effective scene, if you can sift through the kaleidoscope of fake and faker footage shoved on screen, which documents a very real terror of a murder-suicide. Unfortunately, having the fake and faker footage bounce off of each other constantly makes each look goofier as the movie goes on. If this were meant to be a parody of the stone-faced alien-conspiracy documentaries that the History Channel shows on Saturday afternoons in October, then writer-director Olatunde Osunsanmi is on to something because, after a while, the preview crowd I saw it with sure hooted and howled with each ridiculous turn in the plot. There’s a moment where scary music works overtime while the camera spins around an owl that turns its head to never break eye contact with the audience. It brought the house down. As for me, I got the biggest kicks out of watching Will Patton’s wonderful self-parodying – oh, who am I kidding? It’s terrible – performance as a gruff, no nonsense small-town cop who don’t believe in these gosh-dern alien thangs. He’s a hoot, and so is the movie, when it’s not being frustratingly selfish in its pursuit of Paranormal Activity realism and Drag Me to Hell gloss at the same time. The filmmakers had their cake, ate it too, and then spat it up on the screen. It's 10 pm. Do You Know Where Your Food Is? 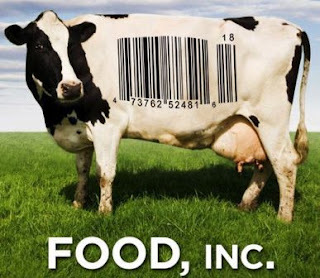 FOOD, INC.
Director Robert Kenner’s Food, Inc. is a commercial documentary that has absorbed the lessons of popular, and populist, docs from the past decade or so, utilizing only their best techniques. Drawing especially from An Inconvenient Truth (without the PowerPoint) and Michael Moore’s work (without the stunts), the movie alternates talking heads with damning footage to build a case against our modern agricultural system which uses all kinds of corporate skullduggery to make ever greater amounts of money off of increasingly unhealthy and unsafe products. I won’t argue with the message; this is another case of a documentary preaching to a choir member. The movie is effective and scary, at times, but ultimately there’s a sense of impersonal gloss over the whole production that proves distancing, as well as a sense that the argument is old news, especially if, like me, you’ve read any of the important food-related journalism of Eric Schlosser (Fast Food Nation) or Michael Pollan (The Omnivore’s Dilemma). Ultimately, there’s nothing wrong with being reminded of important facts and, since no one can know everything, there were some examples given in the film of which I had been previously unaware. Maybe you haven’t heard any of this before? In that case, Food, Inc. will be a real eye-opener. Food, Inc. is on Blu-ray and DVD tomorrow, November 3.